I was starting to get worried that I wouldn’t get anything done today. Today was a good day to do something creative since my hands weren’t hurting or shaking as bad but of course my creative juices were sapped. 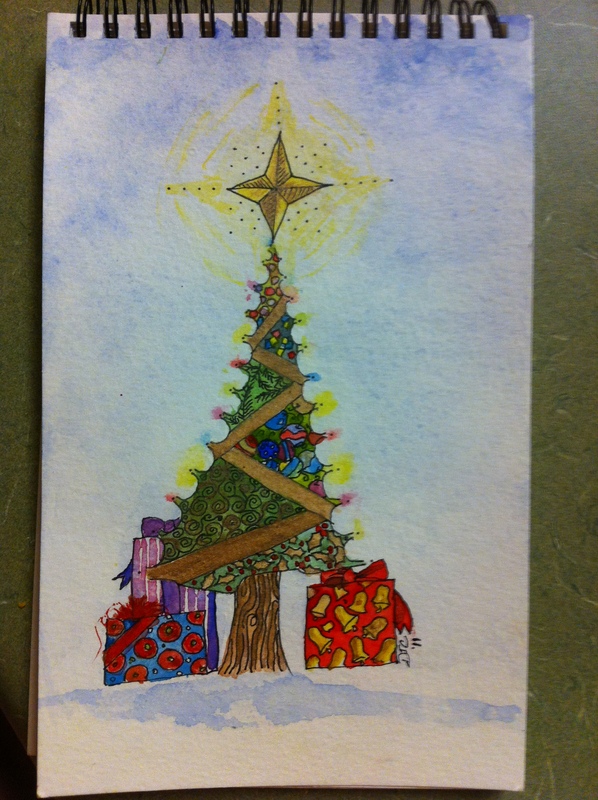 So I ended up re-doing my Christmas Zentangle on watercolor paper. I have a bigger picture that I’m working on but it has become a challenge for me. I’ve never successfully drawn any kind of animal before. I’ve attempted to draw my dog blue before and that turned out scary! I can draw people faces well but animal faces…. bad! So I’m going to work on this for a while and see what I can do. I’ve made the picture I want to paint my desktop so I can study it better. Maybe seeing it more often will help too. I am thinking about this year’s Christmas cards. I’m thinking this would be cute if I can get it just right. I think I might add a little something to this but I don’t have what I want to use right now. I have to add that my camera really brightens up the yellow. It is much more subtle and blended then it appears here. The “lights” on the sides of the tree are also soft and blended and here they look like harsh blops of paint. I’m kinda happy with this though. That looks like it would make a lovely Christmas card! Really cute. I just ordered a run of Christmas cards with my paintings on them, and I am so eagerly awaiting their arrival! Keep up and I hope you continue to feel better each day! This is really pretty. I love the colours and the sky. Great idea for your Christmas card. I agree on taking a shot of the painting to find little things that might need tweaking. I use this little trick all the time! Happy Creating! I’m having the same problem – this first week has been very busy on it’s own so already I’m feeling the push of keeping up. But I’m looking at a fairly clean calendar next week and should be able to get back to some of my process pictures. meanwhile quick zentangles work – I LOVE zentangles, thus am enchanted by your tangled tree! Look forward to seeing more! Lovely Christmas tree, I love the soft colours in the background, too. I like taking pictures and also the mirror trick for getting a fresh perspective on what I’ve just drawn. It’s amazing what you can pick up that way. I can’t draw people or animals. I keep trying on occasion over the years, but I’m still just not talented in that department. Never tried the camera trick. I only have photographed them when they are done. Might have to try that, too. Rebekah, you should try zentangles. It is really fun and relaxing. You can’t really do it wrong…. well, my tree isn’t really the proper way to do it. Zentangles are not supposed to have a right way up. They are supposed to look good from any angle. But I decided to do my own thing and just play. Just type it into youtube and check out some videos. I saw one person traced their hand and used that as a frame to fill. It looked really neat. Some people have really huge foreheads and I’ve always wanted to utilize that space LOL I bought some of the new colored sharpie “pens”. You can get them really fine. You can find designs to use on youtube or on the internet…or the books of course but I just made up my own for the Christmas tree. The kids would like it too!